Baby Beards! is a picture book full of FUN! -- messes at every meal, cool clocks, bibs with rhymes, healthy foods, a camera capturing the messy moments, and a happy dog. 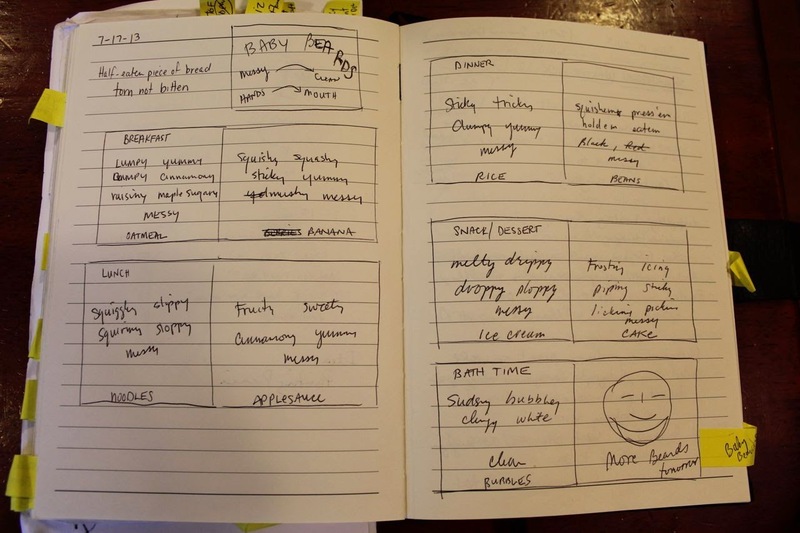 As an added bonus, there are pages for families to add their own photographs, record "First Foods" and "Favorite Foods" for their little ones. AND none of these ideas were in my first draft!! These ideas came over time. They weren't rushed and with a little help from an expert at the Mazza Museum I started to feel like Baby Beards! was going to be a special book. 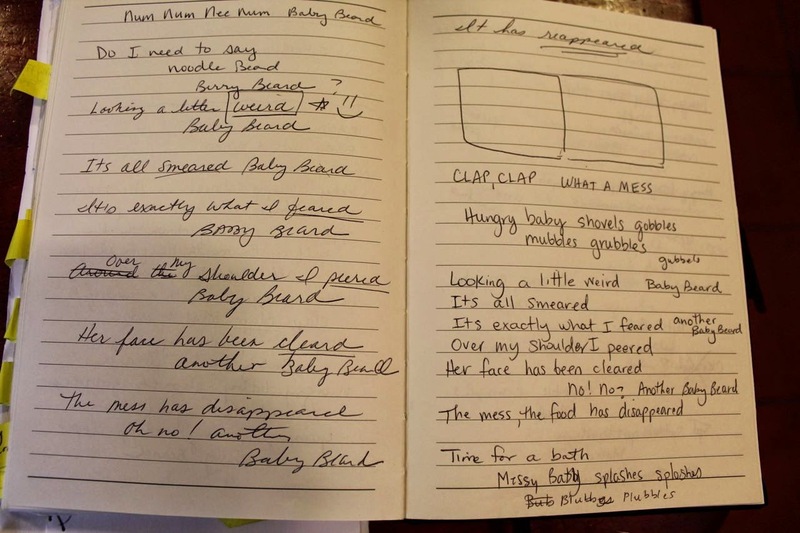 I like to let my writing ideas rest in my journal. After my first draft of Baby Beards! in March 2013 I didn't write anything else with a pencil until April 2013. I say without a pencil, because some of my best writing doesn't happen with a pencil. I love playing with words and sorting out possibilities for illustrations in my mind. (There is also plenty of time that I am not consciously thinking about the idea at all! I think this is important too!) 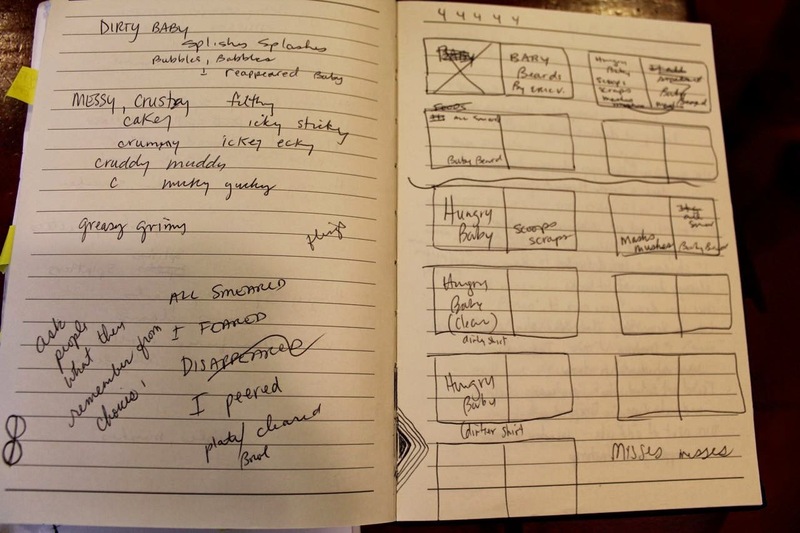 Then, once I feel I have made progress or I have an idea that has moved the story further, I write it down in my journal. 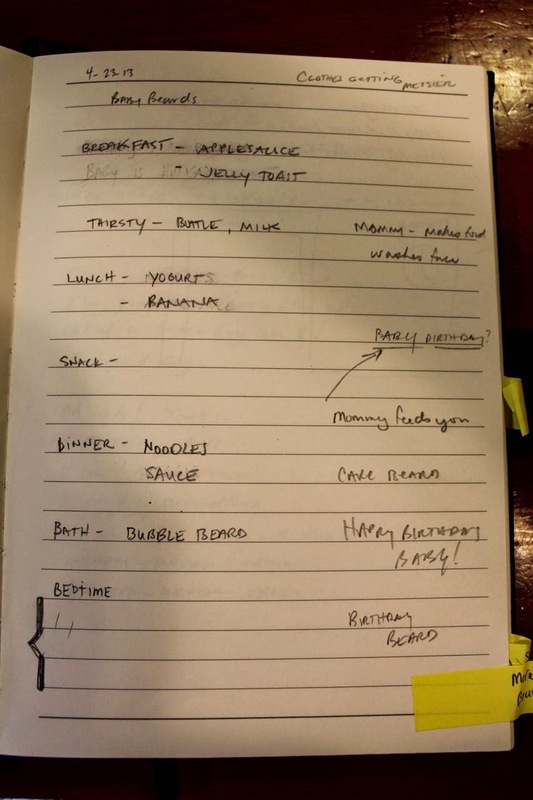 In the April 2013 draft, there are elements that I wrote which found their way into the final book. 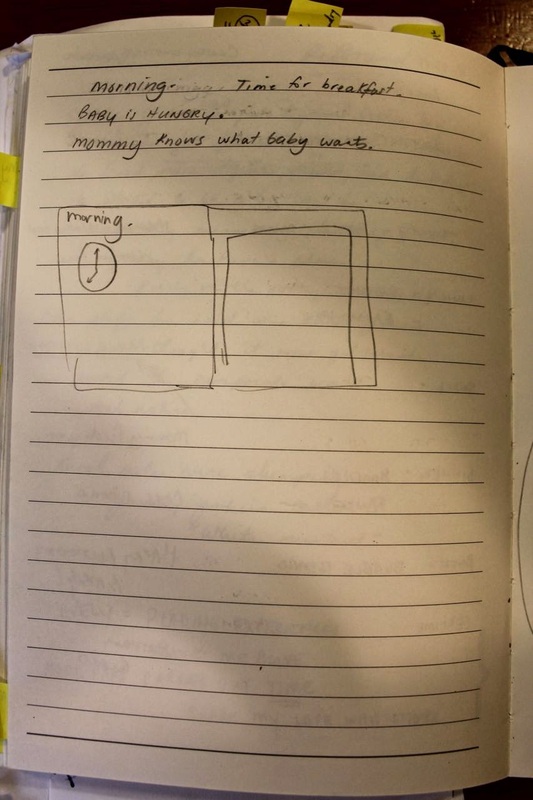 I established that I wanted scenes -- breakfast, lunch, snack (which I later moved to before lunch time because my children always napped before dinner and never snacked in the afternoon), dinner, bath, and bedtime (didn't make it into the final book). 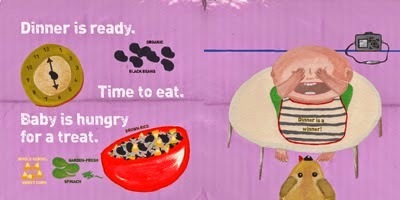 Spread from dinner scene from Baby Beards! In July 2013, I attended the Mazza Museum Summer Conference in Findlay, Ohio. I chose to enroll in the Children's Writing Strand offered throughout the week after I saw that author Michael J. Rosen would be participating and mentoring attendees. Two nights during the week of the conference I got a hotel room (BY MYSELF!! IT WAS SO QUIET!) where I wanted to take full advantage of what I was learning during the day from Michael J. Rosen. I revisited Baby Beards! on July 17, 2013 for the first time since April 2013! 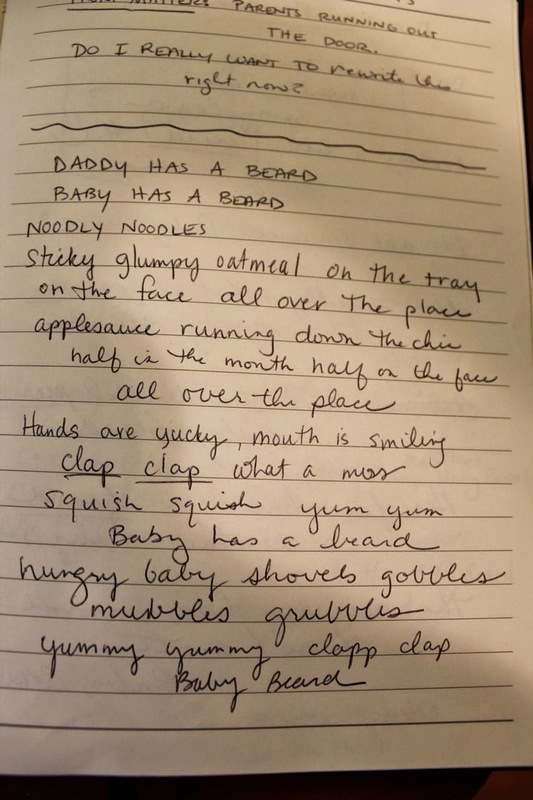 It was a long time since I wrote with a pencil, but I couldn't wait to explore Baby Beards! after being inspired by the visit to the Mazza Museum. I drew storyboard boxes to represent the five scenes of Baby Beards!. In each box I wrote foods that could be eaten and adjectives that would describe each one. For example, Breakfast -- oatmeal -- lumpy, yummy, bumpy, cinnamony, raisny, maple sugary, messy. At this time, I had not decided to use the healthy food theme for the book because the snack was cake and ice cream -- melty, drippy, droppy, ploppy, messy, cake - frosting, icing, piping, sticky, licking, picking, messy. The next night in the hotel, July 18, 2013, I tried a technique that Michael J. Rosen talked about in one of our sessions. He encouraged us to write and NOT CROSS OUT ANYTHING. Just write whatever pops into your head. Rosen believes that the words are inside your head and they will come out as your write. I thought I would give it a try with Baby Beards! as the focus of my thoughts. And guess what? HE'S WAS RIGHT! I started writing, "Daddy has a beard. Baby has a beard." Then, that led to "noodly noodles" and "sticky glumpy oatmeal on the tray." As I kept writing I wrote things like "what a mess" and "looking a little weird" and "It's all smeared". I really liked the rhyme -- beard and smeared! So, I played with that -- "Looking a little weird. Its all smeared. Its exactly what I feared. Another baby beard. Over my shoulder I peered. Her face has been cleared. No! No? Another baby beard. The mess, the food has disappeared. Time for a bath." The little technique from Michael J. Rosen really got me going. I then started playing with alliteration. 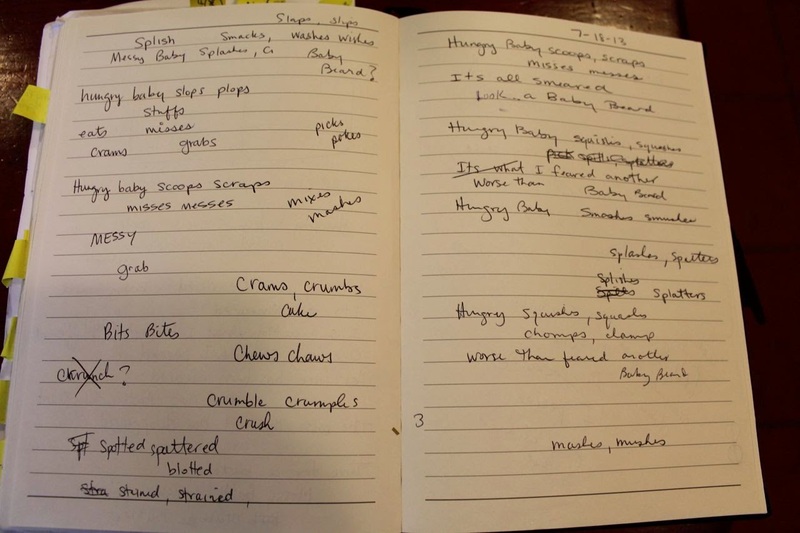 I wrote more and more words -- crams, crumbs, cake and mixes, mashes, misses, messes. None of this really ended up in the book, but the playfulness of the words really helped me with the direction I wanted to go with the book. One more thing about my experience at the Mazza Museum with Micheal J. Rosen. I was in a critique meeting about another manuscript I was writing at the time. Rosen suggested I needed another character in my book and maybe it could be a dog. I often wonder if that suggestion by Rosen led me to include a dog as the young child's companion in Baby Beards!. Including a dog really moved the book in positive new direction. From March 2013 to July 2013, I only sat down to write four times. I feel those writing times were effective in moving my manuscript for Baby Beards! forward because I didn't force the ideas. I let them come to me. I took my time. I had heard this so many times from other authors that I study at Happy Birthday Author, but I had never experienced it myself. I found some words that I really liked -- beard, smeared, disappeared, and "WHAT A MESS!". Even with all this progress, at the time, I didn't know I was still almost ONE WHOLE YEAR away from holding the book in my hand. I stayed focused and motivated because I believed in Baby Beards!. This was part two of how Baby Beards! became my new self-published picture book. (Did you miss Part 1? Click Here!) Want to read Part 3 - CLICK HERE! Love seeing your process, Eric! And I completely agree with Michael Rosen that the stories are already in our heads and it's just a matter of coaxing them out! And it does take time...Congrats again! Thank you for reading and sharing! I learned so much from Michael J. Rosen. He is a fabulous teacher! 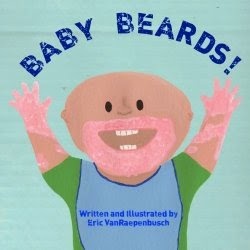 Wonderful to read the process for BABY BEARDS, Eric! Thank you for sharing!